1. 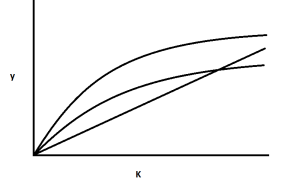 Which of the following images is a graph of the standard intertemporal 2-period model? Enter your answer as a single capitalized letter. 2. 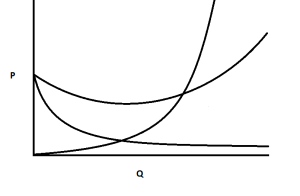 Atomistic markets are supposed to permit the achievement of Pareto optimality where externalities are absent. Explain the meaning of this statement. Atomistic markets are markets where the price and quantity are defined as probabilities rather than points. Pareto-efficiency is a state of allocation of resources in which it is impossible to make any one individual better off without making at least one individual worse off. Pareto-efficiency is a state of allocation of resources in which social utility is maximized and firms pay the cost of the externalities they generate. Pareto-efficiency is a state of allocation of resources in which no superior feasible form of organization can be described and implemented with expected net gains. Atomistic markets are markets where there is a monopoly, a monopsony, or both. Atomistic markets are markets where consumers and producers are price taking and there are no profits. Externalities are another word for free rider effects. Externalities are costs or benefits imposed on a third party who was not voluntarily involved in a particular transaction. *Hint: Williams implicitly assumes costs are accounting costs. False. Risk aversion and cognitive biases empirically dominate both profit and cost considerations. True. By minimizing opportunity cost an agent is able to achieve a superior outcome compared to profit consideration alone. False. Because profit maximization considers opportunity cost it is a superior general criterion. False. Cost minimization is equivalent to profit maximization. Since the approaches are equivalent is it false to say cost minimization is the general criterion. The general criterion for consumers is utility maximization, and for producers is profit maximization. Cost minimization alone does not guarantee profit. One can cost minimize by merely foregoing production. 4. Some discount stores advertise that they can sell for less because they buy directly from the factory and sell to the consumer, thus eliminating middlemen. What is the flaw in that reasoning? If a discount store is a middleman, so by that logic a consumer shouldn’t purchase from the discount store either. Middlemen can add value for firms and consumers by reducing search costs. Firms are price taking in a competitive market. Distributors can reduce the average cost of production by increasing quantity sold. 5. Is the following statement true or false? Explain your answer. If you were a visitor in some underdeveloped country in which all lending and borrowing are effectively prohibited there would be no way to tell whether there were changes in the interest rate. False. There is a real interest rate implicit in the time preference of goods. An increase in demand for future goods implies a change in the real interest rate. False. The interest rate is the rate of return to foregone consumption. Unbanked consumers can forego consumption but they obtain no return, implying a constant interest rate of zero. False. International financial institutions such as the World Bank allow underdeveloped countries to access international financial markets and the global interest rate. True. Because the interest rate arises in a well-structured financial market, underdeveloped countries do not have access to the interest rate. Prices communicate both the relative scarcities of goods and information about the relative preferences of many individuals. Prices are sticky in the short run and therefore they do not represent an economy of knowledge, or an efficient way to communicate. Hayek was making a sarcastic remark. Prices communicate both the relative scarcities of goods and information about the relative levels of risk aversion and nominal income of many individuals. Prices operate with an economy of knowledge because they are a low cost means of communicating a large volume of information. Prices operate with an economy of knowledge because it is possible to construct an accurate forecast using a prediction market. 7. 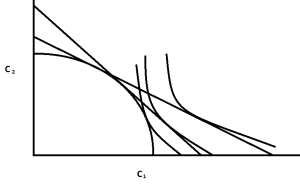 True or false: Cost curves are monetized reciprocals of product curves? Explain. Existing firms in a cartelized industry prefer to be regulated by government. Government has an incentive to shirk when enforcing the cartel. Government reduces cartel enforcement costs and cheating incentive by conducting enforcement on behalf of the cartel and establishing legal penalties for cheating. Cartels break down because of cheating incentive, the availability of substitutes, entry by new competitors, and enforcement costs. Government increases cartel enforcement cost by subjecting firms to taxation which is more costly than private enforcement provision. Government regulation leads to a reduction in the number of available substitutes and a barrier to entry for new competitors. 9. Is the following statement true, false, or uncertain? Explain. A monopolist will never set price and quantity at a point where the demand is price-inelastic. True. A firm will never produce when demand is inelastic because that would entail negative marginal revenue. False. A firm will never produce when demand is inelastic because that would entail negative marginal revenue. Uncertain. Because monopolies can engage in price discrimination, they can determine whether or not the optimal price results in inelastic demand. False. A firm will always produce where demand is inelastic because this gives the firm the ability to charge a very high price without loss of sales. 10. Is the following statement true or false? Explain. Price discrimination tends to be more common in the sale of services than in the sale of manufactured goods. True. The costs of specialized training in the sale of services is lower than the cost of creating specialized manufactured products. False. Price discrimination occurs approximately evenly across sectors of the economy. True. The cost of assessing individual willingness to pay is lower in the sale of services than in the sale of manufactured goods. True. The costs of arbitrage in the sale of services is higher than in the sales of goods.